Wanna an uploader script? Don’t wanna belong to any JS frameworks like jQuery? Wanna customize it easily, use your own css and html design with it? Then you come to the right place. 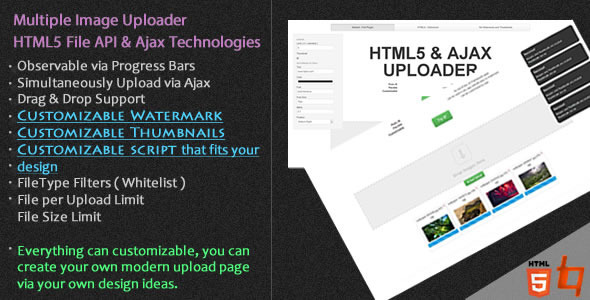 Our Pure Image Uploader script does all of that with ease. We’ve done it as much user-friendly as we could. Our script uses these technologies: HTML5 – File API, Drag&Drop, Canvas etc… Pure JS – AJAX Requests and other manupulations for simultaneously uploads Needs JSON only as a returning result from server – that means you CAN use any server-side platform with our script We provide ASP.NET and PHP scripts with package also we give the idea in the documents that would be under the hood of your script Our script features: Simultaneously multi uploads via AJAX requests Drag&Drop support Support for all type files Icons for File Types Watermark for each image that is being uploaded – Exclusive NEW Progress Bar Thumbnail of each of them if you want Easy to implement, FULLY customizable Limit options – File size limit, file limit per upload Filter by type – accepts only your whitelist types of file png,jpg etc… When HTML5 doesn’t supported by browser, script automatically detects that and show an HTML5 doesn’t supported error and a classic uploader form as well. For HTML5 working at Chrome 24+, Opera 12+, Safari 5+, Firefox 18+ and 10+ The script easy-to-implement when you get used to it, everything in our script is fully customizable. Only thing you need to do is enter your uploader’s elements’ ids to our script’s options. You can customize the way of the look of progress bars in our script, too. You can customize the HTML5 error that how it placed and rendered. WATERMARKS : You can add watermarks to your images via our script. We support various options to customize watermark that appears on your image by Font options, Color, Text, Position, Alpha. THUMBNAILS : Also you can add thumbnails if you want, you can specify the resolution of that thumbnail would create of.